More than 40 patients, en route from the Oshakati Intermediate Hospital to Windhoek, survived what could have been a deadly road accident when two rear wheels of a six-wheel bus transporting them to the capital city, fell off. However, the driver managed to skillfully control the bus and to bring it to a standstill. The accident occurred on Monday on the main road between Otavi and Otjiwarongo. It is not clear why the wheels fell off, but the suspicion is that the wheel nuts were not tightened properly. 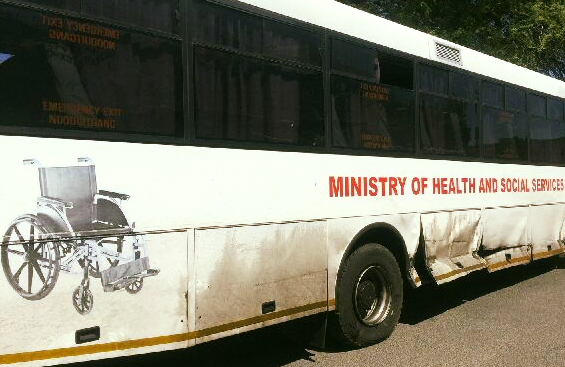 The bus was badly damaged and the patients were evacuated to Otjiwarongo, where another bus picked them up later in the afternoon and transported to Windhoek, minus their personal belongings as the door of the cargo compartment of the bus was damaged and could not be opened. Oshakati hospital patients who need specialized treatment are transported to the Central Hospital in Windhoek. Approached for comment, Oshakati hospital superintendent Dr. Korbinian Vizcaya Amutenya confirmed the accident. 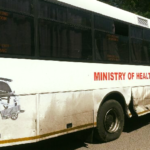 “It is true that two rear wheels of our bus fell off between Otavi and Otjiwarongo on Monday. There were 41 patients, one nurse and the driver on board. Fortunately no one was hurt and patients continued their trip with a backup bus to Windhoek,” he said. Amutenya said that, as a rule, patient busses are regularly checked for fitness by designated authorities and by drivers themselves, but added that human errors are always possible. “If my memory serves me well, this is the first time such an incident happened and is a lesson we take seriously to ensure that no such incident happens in the future,” he said.